Holland, D., Lachicotte, W. Jr., Skinner, D., & Cain, C. (1998). Identity and agency in cultural worlds. Cambridge, Mass: Harvard University Press. We sense that the distinctions between formal and informal learning are becoming increasingly blurred, yet we still resort to using such terms. Within doctoral education – the focus of my thesis – the dichotomy is particularly ambiguous and unreliable. Even if we think of formal and informal learning as a continuum, where do we place something like presenting at a conference, or publishing a paper? These are rarely formal requirements of a PhD, yet there is an expectation that a doctoral student actively pursues such opportunities. What about attending seminars, or taking on a teaching role? Where might we place these? And how do different disciplines, faculties and doctoral programmes determine the importance of these practices? Universities assume the custodianship of doctoral learning through the formal induction and integration of PhD students within a supportive research environment; one that provides supervision, research training and facilities, and other support services, and fosters a mentor- and peer-based community of practice. Wenger (1998) describes practice as a dialectic relationship between participation and reification. A learner’s trajectory can therefore be understood in the interrelated dimensions of greater participation and engagement within an academic community and increased familiarity with the signs and discourses that reify that participation. According to Davies and Mangan (2006), models such as communities of practice provide a social regulation of learning. 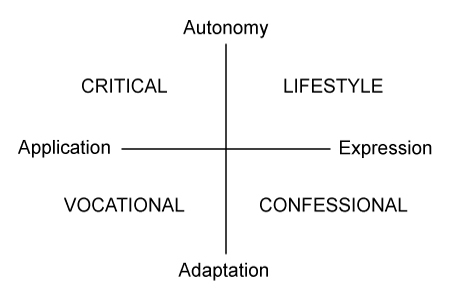 Whilst the individual student develops a unique set of reference points to her learning process, these must attain legitimacy within the context of the community she is acting. Since communities derive their coherence from particular ways of practicing, they regulate how the student’s progress can be recognised as learning. This is usually manifest as curricula and the attainment of qualifications. In doctoral education, where there is far less of a structured programme, and a greater emphasis on student efficacy and negotiated study, this notion of legitimacy as a defining characteristic of the learning trajectory becomes particularly pertinent. My own research and teaching indicate that the lack of recognition associated with the use of social media (and the ‘value’ of their related artefacts, such as blog posts) compared to established scholarly pursuits – getting a paper published or presenting at a conference – can be a major disincentive for postgraduate researchers. Yet in my own field of study, it is expected that I become familiar with, and actively engage in the social web, because of its elevated status as a legitimate academic practice within my research communities and networks. Davies, P., & Mangan, J. (2006). Trajectories of students’ learning: threshold concepts and subject learning careers. Paper presented at the Annual Conference of the Society for Research in Higher Education, University of Brighton. Here, Gardner refers primarily to the academic disciplines. Whilst acknowledging the necessity to achieve mastery in one discipline (which usually takes a minimum of 10 years), he stresses the need to recognise the distinctive (and essentially unnatural) ways of thinking in other major schools of thought. Quoting physicist Murray Gell-Man – who suggested the synthesizing mind will be the most important in the 21st century – Gardner suggests this is the most urgently required of the five minds, yet remains the least supported in formal education. Synthesis requires the ability to integrate ideas from different disciplines into a coherent whole that is communicable to others. Gardner argues the best synthesizers are those who can cultivate and master synthesizing methods or strategies using a range of formats – maps, taxonomies, narrative etc., which are best developed through goal-driven and feedback processes. The capacity to identify new problems, questions and phenomena. Creativity is not just a cognitive process, but is reliant on personality traits of temperament and attitude, and on feedback from others in the field. The ability to empathize; to acknowledge, understand and eventually contest the views of others. The fulfillment of one’s professional responsibilities and moral obligations as a citizen. 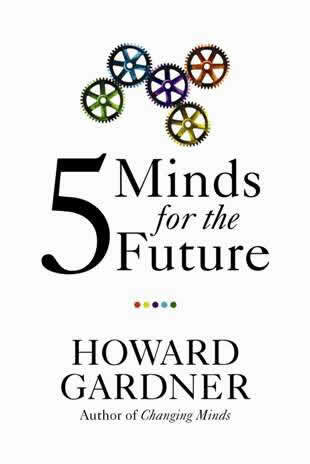 Gardner acknowledges integration of the five minds is prone to tensions, and that most individuals will have a tendency towards some over others, He concludes by emphasizes the need to expose students to societies, communities and people where qualities derived from these minds are encouraged and influential. Quoting physicist Murray Gell-Man – who proposed the synthesizing mind will be the most important in the 21st century – Gardner suggests this is the most urgently required of the five minds, yet remains the least supported in formal education. Synthesis requires the ability to integrate ideas from different disciplines into a coherent whole that is communicable to others. Gardner argues the best synthesizers are those who can cultivate and master synthesizing methods or strategies using a range of formats – maps, taxonomies, narrative etc., – which are best developed through goal-driven and feedback processes. Gardner acknowledges integration of the five minds is prone to tensions, and that most individuals will have a tendency towards some over others, He concludes by emphasizing the need to expose students to communities and societies in which the qualities derived from these minds are both encouraged and prevalent.